Hiking, biking, fishing, kayaking, golfing, snowmobiling, and more await in Otsego County. Four state parks sit within Otsego County including Glimmerglass State Park, Robert V. Riddell State Park, Gilbert Lake State Park, and Betty and Wilbur Davis State Park. 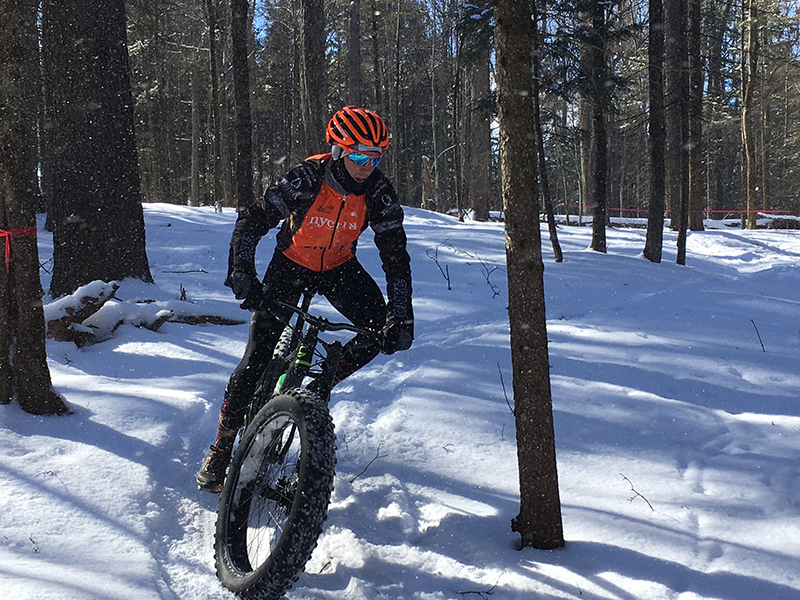 The same trail system that allows for 40 miles of mountain bike tracks turns into a cross-country skier’s paradise during the winter months. The area offers over 300 miles of snowmobiling trails through the rolling foothills of the Catskills. Anglers will find year-round fishing opportunities on the region’s many waterways, including fly fishing and ice fishing. Perhaps Cooperstown’s biggest claim to fame is the National Baseball Hall of Fame and Museum. Located at 25 Main Street in downtown Cooperstown, the Hall of Fame is open seven days a week and aims to foster a deep appreciation for America’s favorite pastime in all of its visitors. Especially noteworthy is the Plaque Gallery, where all 323 Hall of Fame members’ bronze plaques honor their athletic achievements. With over 60,000 square feet of exhibit space, the Hall of Fame explores ballpark memories from the beginning of the game to today, as well as baseball’s greatest records. For a complete list of current and upcoming exhibits, visit www.baseballhall.org. 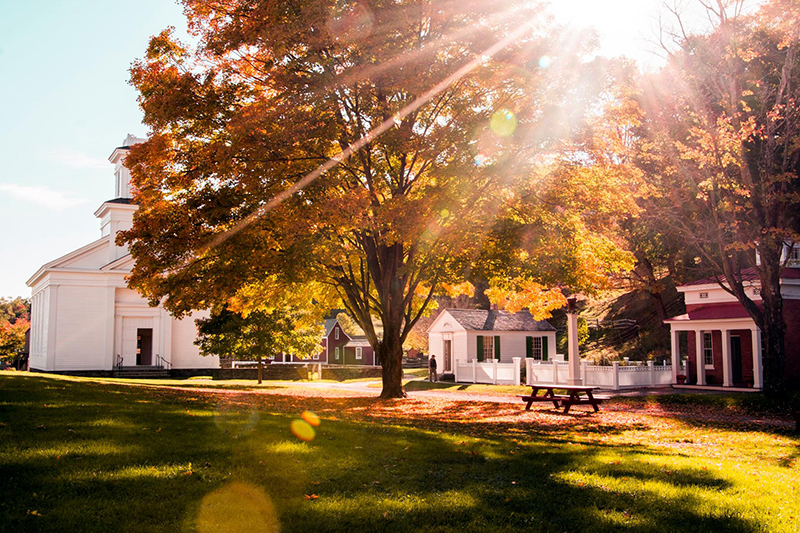 From baseball to agriculture and American art, some of Cooperstown’s top attractions include the National Baseball Hall of Fame and Museum, the Fenimore Art Museum, the Glimmerglass Festival, the Farmers’ Museum, Brewery Ommegang, and Fly Creek Cider Mill & Orchard. Don’t forget to visit the Joseph L. Popp Butterfly Conservatory in Oneonta and take an entertaining ride aboard the Cooperstown and Charlotte Valley Railroad. Lastly, Cooperstown and neighboring Oneonta’s Main Streets both feature ideal strolling and window shopping. Hit the trail! The Cooperstown Beverage Trail that is, with the aid of a map provided by www.cooperstownbeveragetrail.com. Originally comprised of four establishments — Bear Pond Winery, Cooperstown Brewing Company, Brewery Ommegang, and the Fly Creek Cider Mill — the trail has grown include Butternuts Beer & Ale, Rustic Ridge Winery, Pail Shop Vineyards, and Cooperstown Distillery. 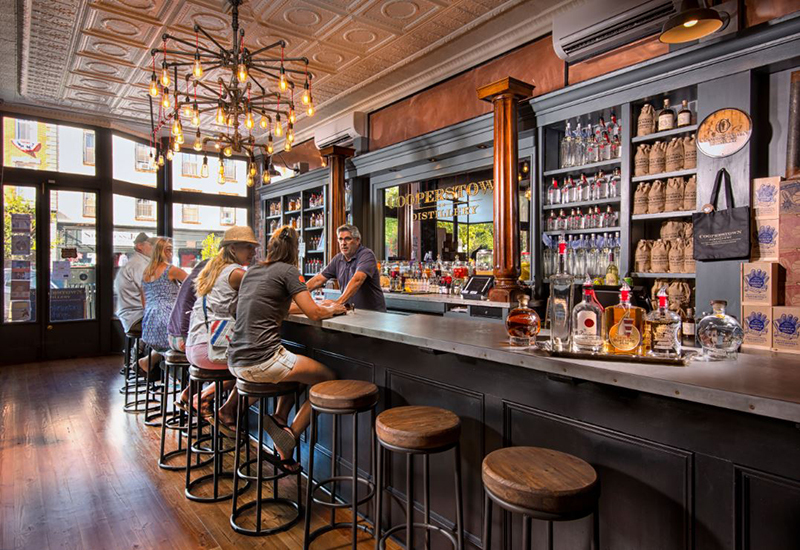 All of these producers are a testament to Cooperstown’s history of fine drink. For example, did you know that Cooperstown was once the hops-growing capital of North America? Why not pair the great views of central New York with some delicious cuisine? For lakeside dining, try Lake Front Restaurant or Blue Mingo Grill. Farm fresh foods and locally inspired menus can be found at Origins Cafe at Carefree Gardens and Danny’s Market, which boasts “the best chicken sandwich in the world.” After a day of baseball, take the family to New York Pizzeria, Cooperstown Back Alley Grille, or Toscana Italian Fusion & Grill. Enjoy a sweet treat no matter the weather at Golden Guernsey Ice Cream or The Cooperstown Penguin, where you can create your own customized ice cream flavor. Council Rock Brewery, Bocca Osteria, and Nicoletta’s Italian Cafe are great options for a romantic dinner for two. Cooperstown and Otsego County offer an array of accommodations, perfect for traveling families, couples on a romantic getaway, or special occasions. The luxurious and historic Otesaga Resort Hotel was built in 1909 and features an impressive Federal-style edifice and front portico along with massive 30-foot columns. The Otesaga occupies 700 feet of lakefront on the southern shore of Otsego Lake. The hotel was built by Edward Severin Clark and Stephen Carlton Clark, two grandsons of Cooperstown’s well-known benefactor, Edward Clark. The family’s other building projects include the Dakota on Manhattan’s Central Park West. With the idea that their wealthy guests might want to play golf, the Clarks constructed Leatherstocking Golf Course adjacent to the hotel. Leatherstocking was designed by Devereux Emmet, and is still considered to be one of The Otesaga’s top attractions. To book your reservation, visit www.otesaga.com. Located in the heart of the village and close to the National Baseball Hall of Fame and all of Main Street is The Cooper Inn. Situated on scenic, park-like grounds, The Cooper Inn recalls the elegance and grandeur of 19th century Cooperstown. Things don’t slow down in Otsego County during the late fall and winter seasons. In fact, the cozy weather brings weekends full of entertaining activities for outdoor enthusiasts, baseball fans, food lovers, and art critics alike. The Glimmerglass Film Festival 2018: Passages begins on Thursday, November 8 and runs through Monday, November 12. This year’s theme will showcase and explore cinematic passages of all kinds — from physical to geographical, emotional, and spiritual. For ticketing information, visit www.glimmerglassfilmdays.org. Wassailing Weekend at Fly Creek Cider Mill & Orchard takes place Saturday and Sunday, November 17 and 18 (this is a reoccurring event through select weekends in November and December). Demonstrators will showcase the preparation of the traditional holiday drink, including the savory spices and sweet cider involved. Santa Express at the Cooperstown & Charlotte Valley Railroad offers children the chance to take a train ride with Santa, Mrs. Claus, and their helpers. All of the Holiday Trains burst with colorful lights, displays, and Christmas spirit, including on-board holiday music, sweet treats, and refreshments. The Santa Express starts November 23 and runs through December 16. Seating is limited and group discounts are available. For more information, call 607.432.2429. Shop Small Saturday in Oneonta on Saturday, November 24, a great way to show support for local artisans, crafters, and shop owners. Also on November 24, The Farmers’ Museum presents Thanksgiving at the Farm. Walk off your holiday meal with a leisurely stroll through the historic village at the museum. Day of Holiday Fun in Oneonta starts on Saturday, December 1 and includes the Home for the Holidays Parade, Gingerbread Jubilee, Festival of the Trees, and more. One of the region’s best-loved holiday traditions is the Candlelight Evening, during which the landscape of The Farmers’ Museum is transformed with seasonal greenery and aglow with hundreds of candles. Join the local community for the Cooperstown Concert Series 49th Season on Saturday, December 15 with a performance by The Empty Pockets, a soulful Americana band that will be performing at the Ballroom at the Village Hall in Cooperstown. 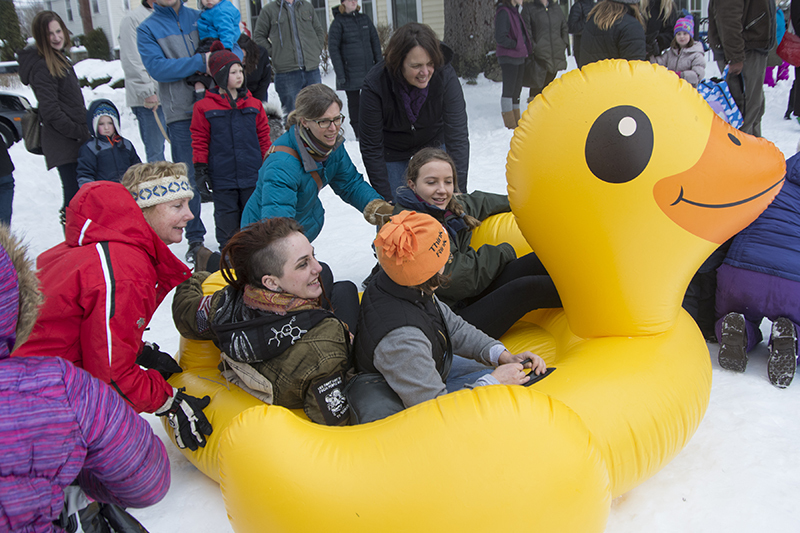 The 2019 Cooperstown Winter Carnival is scheduled for February 8, 9, and 10. Find your way to Cooperstown by car, bus, train, or plane. Located in the foothills of the Northern Catskill Mountains of New York, Cooperstown and Otsego County are situated in the south-central part of the state, approximately 4 hours from New York City and 1.5 hours from Albany. The drive itself is a beautiful one, and features great leaf peeping during the autumn months. From the south, take Routes 1-88 and 28 towards Binghamton/Oneonta/Cooperstown. Bus service is offered through Adirondack Trailways. For fare and schedule information, call 800.858.8555. Oneonta Public Transit operates Monday through Saturday (closed on Sundays) and maintains an Oneonta to Cooperstown bus line. Call 607.432.7100 for departure times. Find yourself in Cooperstown by rail! Visitors can take the train to Albany-Rensselaer Station and then rent a car for the 76-mile drive to Cooperstown. Better yet, Amtrak has teamed up with Trailways of New York to offer service from New York City to Cooperstown via a train/bus combo ticket. Major airports are located in Albany, Syracuse, and Binghamton. The driving time from Syracuse is slightly less than 2 hours and Binghamton is 1.5 hours. Otsego County is served by two small airports — Cooperstown Westville and Oneonta Airport.